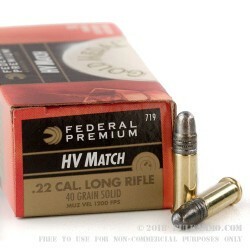 This Federal Premium Gold Medal HV Match 22lr ammunition is topped with 40 grain, all lead, solid round nose bullets. These bullets are loaded into new, reloadable (with the right equipment), polished, Non-corrosive primed, brass, rimfire cases. The muzzle velocity of these 22LRs is 1200-feet per second, and they sport 128-foot pounds of muzzle energy. These are the ideal round for shooting competitions, handgun matches, and off-hand target shooting. These Federal rimfire loads come in packs of 50 rounds, easily recognized by the Black and Orange-Red look of the Gold Medal boxes. Get a case or 2 now to make sure you have enough 22LR in your armory. Federal Premium is a large ammunition company that is based in Minnesota and is currently owned by the juggernaut VISTA Outdoors. 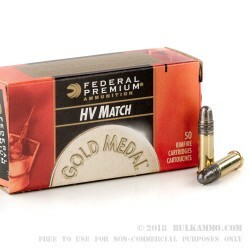 Federal Premium Gold Medal Match ammunition has been the industry leader with regards to highly accurate, extremely reliable, high performance ammo. The Gold Medal line is often used as a benchmark when testing the accuracy of a new rifle or any new platform, due to the consistent product manufacturing tolerances. They use the same brass, bullets, primers, and powder, every time, to ensure a consistent product leaves the factory. In addition to the rimfire ammo, Federal also makes shotgun ammo, rifle ammo, handgun ammo, and so on. 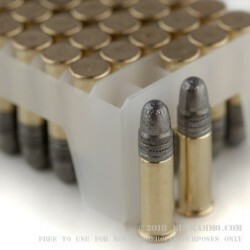 Multiple calibers and bullet weights are available in each of the ammo types too. Q: What is the velocity of this ammo? A: Hello Kevin, Federal lists the muzzle velocity of this round as 1200 fps.